An inanimate object fueled Carol Wiebe's desire to create her main project with here Floral Facets Collection for June 2017 StencilClub. Her video class for this month's StencilClub includes the application of her DIY Gelli fabric printing technique to pillows ~ complete with sewing instructions! Bonus! 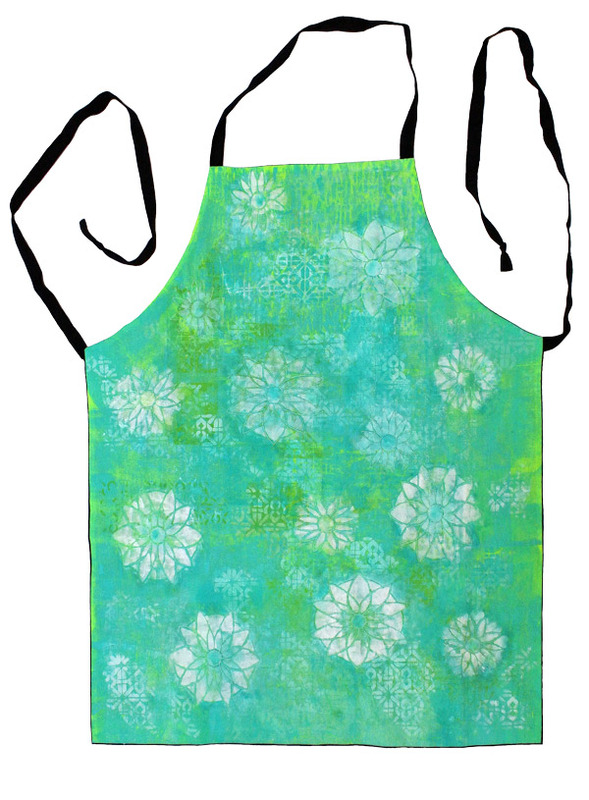 Reversible apron tutorial you can easily size to fit! Will you choose to follow these patterns or does Carol's Floral Facets Collection inspire your creative muse in another direction entirely? It might? Wonderful! 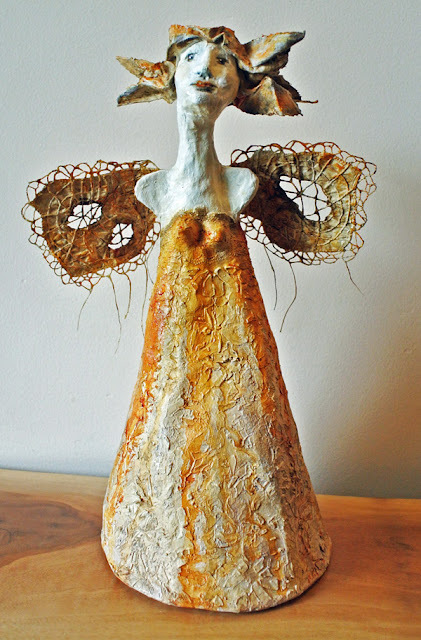 Carol's brain took her mind and heart to sculpture, more cloth, and citrasolv paintings! Carol created this winged sculpture out of newspaper and masking tape. After shaping the body, she applied copy paper strips with acrylic medium to create a hard shell. 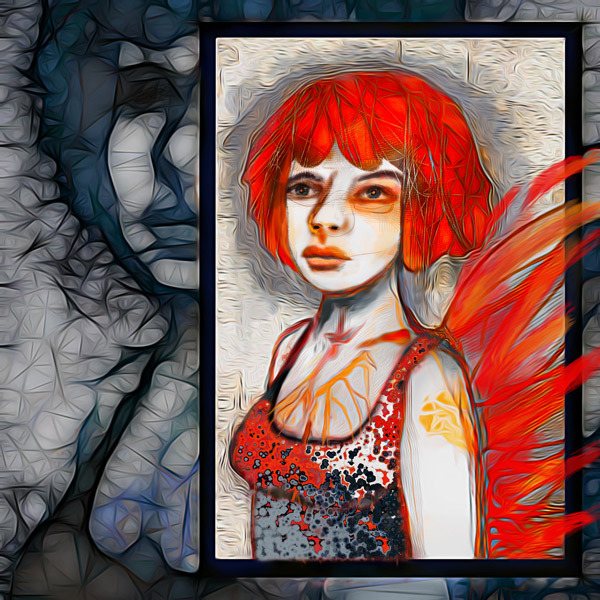 The headpiece and wings were fashioned out of copy paper as well, held in place by acrylic medium and, in the case of the wings, stitched. Her 9x12 stencil from Floral Facets was used to turn the dress into a brocade, by applying molding paste with a palette knife. Once dry, a beautiful nickel azo gold wash picked up the various textures. "The setee was trash to whomever put it at the curb, but we liked the way it looked. My husband, Ted, replaced a broken arm, and added some nice brackets he fashioned below both arms. He glued all the joints and fixed up assorted broken bits. I especially love the Greene & Greene touches Ted added: the little wooden square plugs. He then undercoated it all in a dark grey. "Together, working outside, Ted sprayed with black onto the paint while I quickly made marks with a silicone tipped "brush" before the paint dried. We did this one section at a time. Then we took one of my husband's heavy cotton drop cloths and weighted it down with bricks on the lawn. I proceeded to spray and paint it, using the Floral Facets stencils. "The original pillow for the settee had metal springs, horsehair and jute, and was worn out. We bought some good quality foam, which my husband put onto a piece of plywood he appropriately shaped. 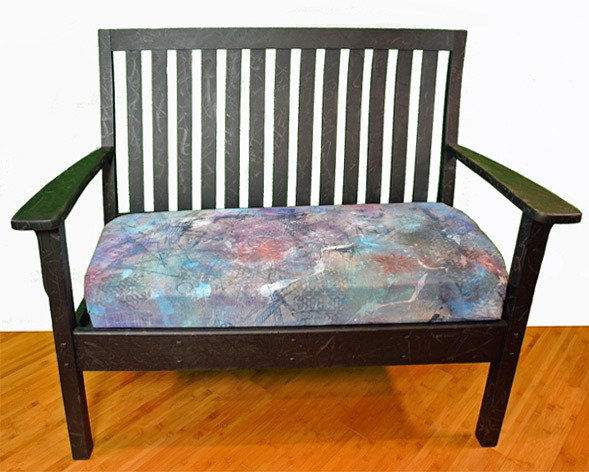 My husband pulled the cloth I created onto the settee, and stapled the upholstery in place." 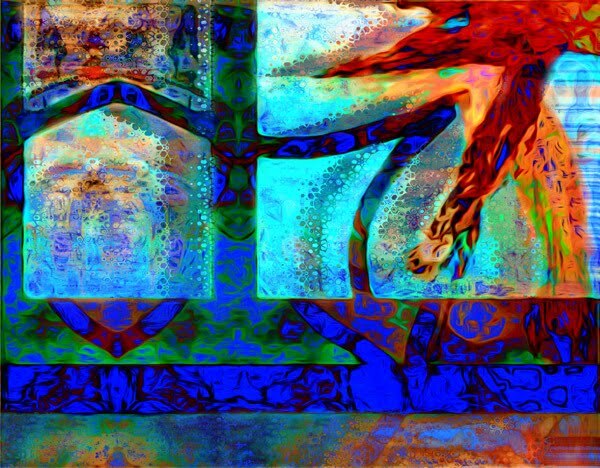 Carol made these prints with her June 2017 Floral Facets Collection of stencils. Be sure to check out her June 2nd Guest Post on StencilGirl Talk where she will share her tips and tricks with CitraSolv with all our stencil loving readers! 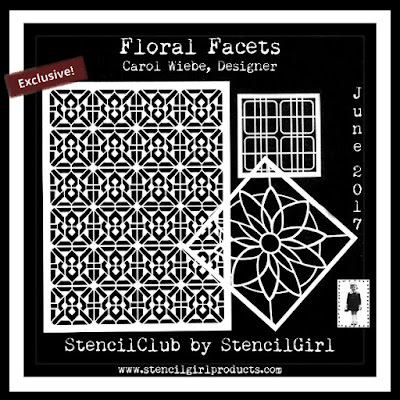 Floral Facets Stencils are EXCLUSIVE to StencilClub members who join by June 15, 2017*. 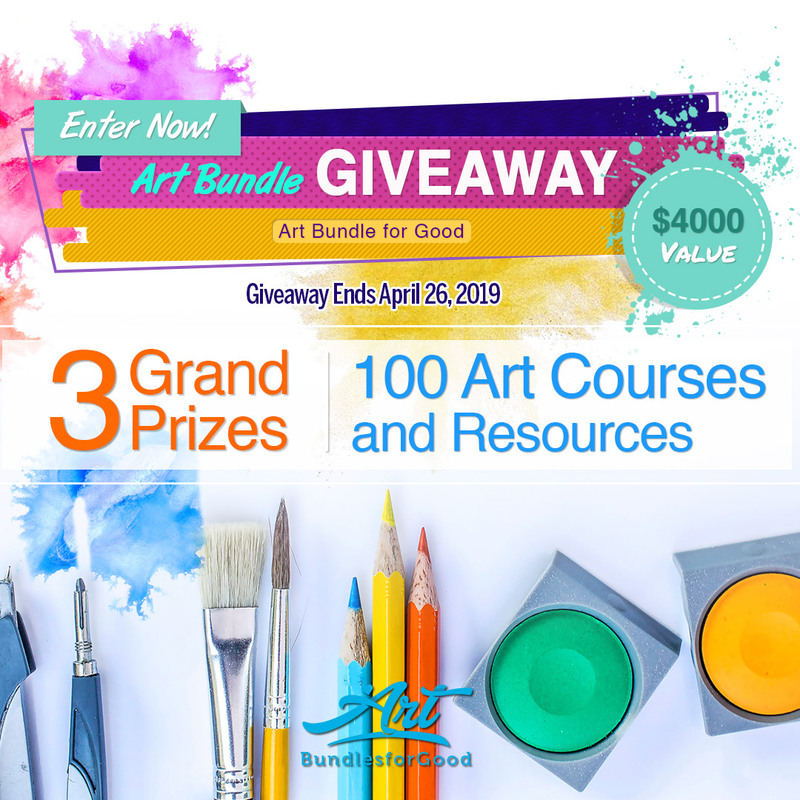 You can become a part of our art community HERE. *6-15-17 has gone by? StencilClub members can order past club sets!